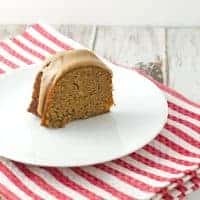 This spice bundt cake with salted caramel glaze recipes makes a dense, slightly spicy cake that’s topped with a delicious sweet caramel glaze that has a nice crunch of sea salt to cut the sweetness. Mr. Savvy’s birthday was back in December and each year I like to make him a homemade from scratch cake as part of his gift. Most years he wants something pretty simple like the traditional yellow cake with chocolate frosting so I was pretty surprised when he said he wanted me to try making a spice cake with a caramel glaze as it was something he grew up with. Spice cake is something I’ve only had a few times over the years and had ever made, but I, of course, wanted to make the cake he wanted for his birthday. After looking at several different spice cake recipes and getting some input from Mr. Savvy I ended up putting together this spice cake with salted caramel frosting recipe. Let me just say that it was so good I’m sure I’ll continue making this one several times in the future. The cake is on the denser side, which Mr. Savvy assured it should be, and is full of spicy flavor. The spiciness isn’t a heat spice, but a warm spice from the variety of spices like cinnamon added to the cake. It bakes up beautifully in a bundt pan, but I’m sure it would also work great in a tube pan, or even in layers or cupcakes. My favorite part was, not surprisingly, the salted caramel frosting. Mr. Savvy had just asked for a caramel glaze, but you see salted caramel everywhere you go these days, and, in my opinion, for good reason. So, I decided to add some sea salt to the glaze and I’m glad I did because it is a very sweet and rich caramel and the salt does a lot to enhance the flavor while also cutting the sweetness. This also makes the glaze and cake pair really well together as the cake isn’t overly sweet and almost a bit more on the savory side like a gingerbread. The glaze is also more of something in between a glaze and frosting. It’s not soft and pillowy like most frostings, but it’s also not thin like most glazes which soak into the cake. 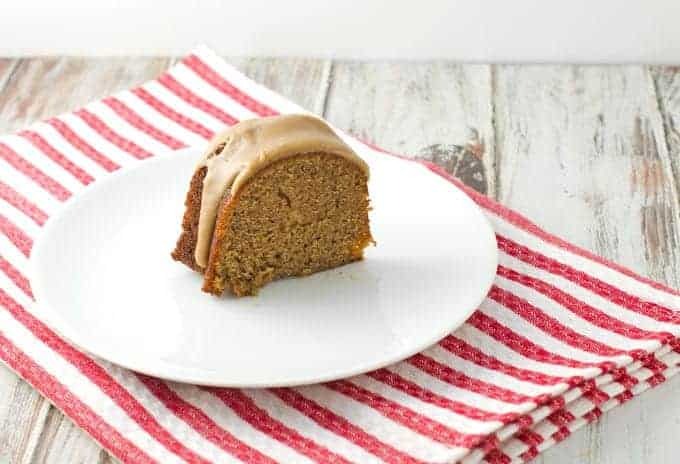 The salted caramel glaze is cooked in just a few minutes and firms up rather quickly giving you just enough time to drizzle it over the spice cake. I’m often asked what products I use when cooking and baking so I thought I’d share some of my must-haves to make this spice cake. The links below are affiliate links to tried and true products in my own kitchen, which means if you click on one of the links below and make a purchase, I may earn a commission fee. Thanks for your support! 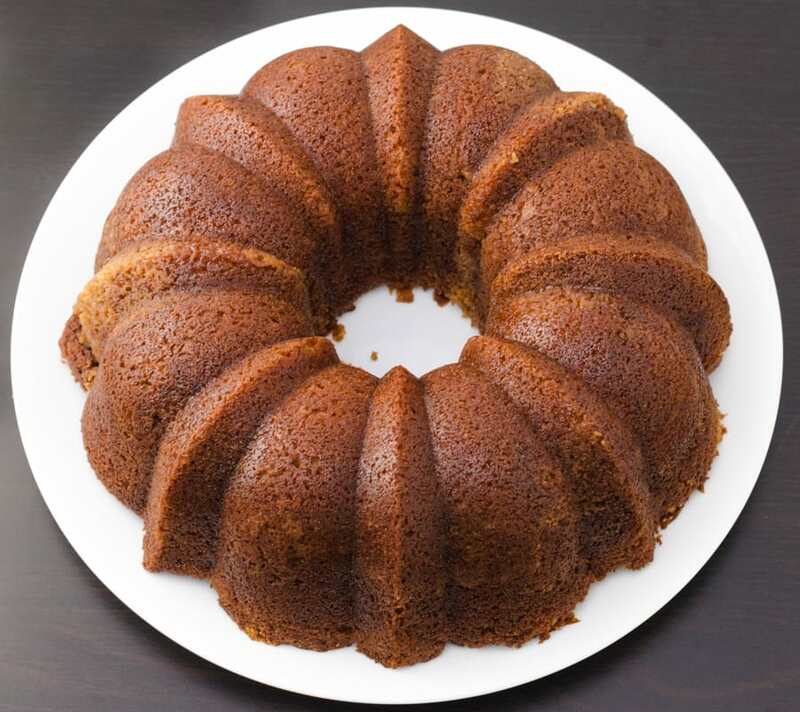 A bundt cake pan – I’ve always had good luck with Nordic Ware products and this bundt cake pan is no different. It has a non-stick finish that cleans up easily and should last a long time as long as you wash it by hand with a non-abrasive sponge. A cooling rack – This is a cake you don’t want getting soft and mushy on the bottom while cooling so a good cooling rack is a must. A sifter – I honestly usually don’t bother sifting powdered sugar for most recipes, but for this glaze you want to sift the sugar to ensure it’s smooth. A mixer – I used my stand mixer to make this cake, but I also use my hand mixer quite often to make cakes in a hurry. A cake plate/saver – This cake can keep several days in the refrigerator as long as it’s covered. I like this one because it can go in the fridge or stay out while being easily transported. 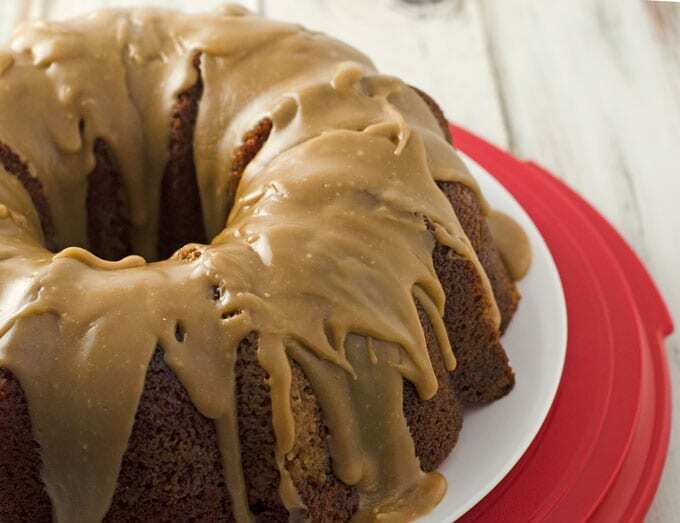 This spice bundt cake with salted caramel glaze recipes makes a dense, slightly spicy cake that's topped with a delicious sweet caramel glaze that has a nice crunch of sea salt to cut the sweetness. Preheat the oven to 350°F and grease your bundt pan. I like to use a baking spray that has flour in it. In a large bowl whisk together the flour, baking powder, baking soda, salt, cinnamon, nutmeg, ginger, allspice, and cloves until thoroughly combined. Set aside. In a large mixing bowl or the bowl of a stand mixer fitted with the paddle attachment, add brown sugar breaking apart any large clumps. Add in butter and applesauce and beat until well combined. Scrape down the sides of the bowl with a spatula. Add in the eggs and vanilla all together and mix until well combined. Scrape down the bowl again if needed. While mixing on low, add in half of the flour/spice mixture until well combined. Then add in all of the buttermilk and mix again. Lastly, add in the last half of the flour mixture until well combined. Make sure to give one last stir with a spatula to make sure you don't have any flour pockets at the bottom of the bowl. 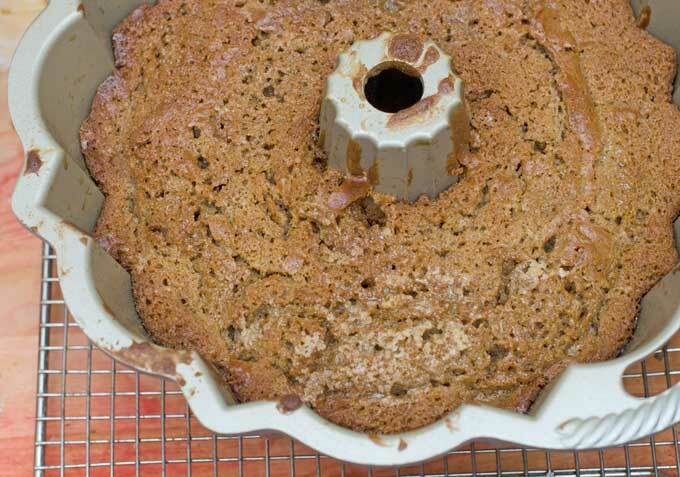 Pour the cake batter into your greased bundt cake pan and bake in the preheated oven for 40 minutes to 1 hour, depending on your oven and the size of the bundt pan used. You should be able to stick a toothpick or knife into the cake and have it come out clean to know it's done. One the cake is done, allow it to cool for about 10 minutes in the pan on a cooling rack. After 10 minutes, run a knife around the edges of the cake if needed and invert the cake onto the cooling rack to finish cooling completely. You won't want to make the glaze until the cake has thoroughly cooled. You can also cover and store the cake in the refrigerator overnight before glazing. Please note that this glaze firms up rather quickly so be prepared to make it and pour over the cake immediately. In a medium-sized saucepan over medium-high heat, add the butter and melt. Whisk in the brown sugar, salt, and cream until thoroughly combined. Bring the mixture to a rolling boil and then let it boil for about 1 minute without stirring. Remove from heat and whisk in powdered sugar until you reach your desired consistency. The more sugar you add, the thicker the glaze will be. I started with 3/4 cup and ended up using the whole cup. Once the sugar is thoroughly incorporated into a smooth glaze, immediately pour or spoon the glaze over the cake. Sprinkle a small amount of sea salt over the glaze while it's still warm, if desired. Let the glaze cool for at least 30 minutes before serving. Store leftovers tightly wrapped in the fridge for up to one week. Was really yummy and instructions clear. Definitely making this again! Loved the spice bundt cake! It was sooooo yummy! So glad you enjoyed it, Kathy. Thanks for coming back to let me know!